I'm usually not a fan of the jukebox musicals, but when the songs used are little known ragtime gems from female composers, I approve! In just a brief 75 minutes, Ragtime Women manages to tell a compelling story about four real life women who composed music in the early 1900s, while sharing over two dozen songs of the era, many of them written by these women. It's smartly constructed (by Theatre Elision founder Cindy Polich), well performed, and a promising debut for this new company. But it's a short run so act quick to see this short, sweet, and musically delicious little show before it closes on Sunday. 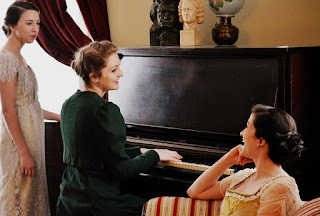 In this fictionalized but well-researched (much of which is printed in the program for your reading pleasure) story, young aspiring musician Julia Niebergall (Christine Polich, who also acts as vocal director) meets her idol Cora Salisbury (Jen Maren), star of the Vaudeville circuit. Well, at least a minor star, who also composes music. Cora gives Julia advice about music and life. She tries to warn her about the difficulties of a life on the road, especially for women, but Julia is undeterred. 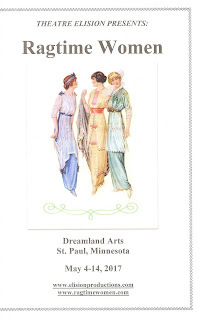 Back home (somewhere in Indiana), she and her friends May Aufderheide (Krin McMillen) and Gladys Yelvington (Tara Schaefle) write music for May's father's publishing company. Gladys soon gladly gives up music to become a wife and mother, while May attempts to do both. 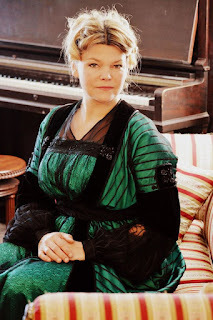 Julia, on the other hand, agrees with Cora that "marriage is an impediment" and focuses solely on her music. The three women make different choices, but have left a legacy of music that, thanks to this production, lives on. And such music! 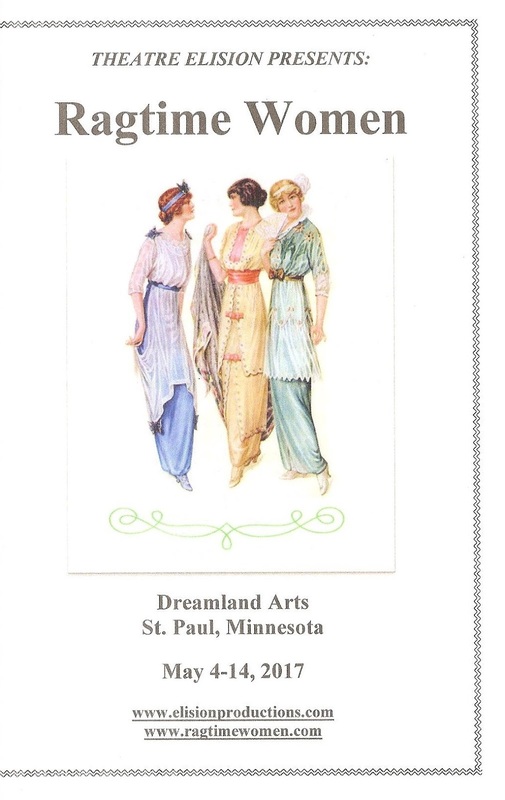 Ragtime is a really fun style of music, and this show captures the style well with talented pianist/arranger/music director Harrison Wade and these four women, all of whom have beautiful voices (blissfully unmiked in the intimate space that is Dreamland Arts). There are some instrumentals (including one of the most well-know ragtime songs - Scott Joplin's Maple Leaf Rag), some songs of the period with lyrics (including some by Gerschwin and Berlin), and some rags with original lyrics written by the playwright. It's a nice collection of songs and the new lyrics let us get to know the characters a bit better, and take the show from play-with-music to musical. Another nice feature of the show is the projections of period photos and sheet music of the songs being played. Along with a few simple set pieces of period furniture and the lovely period dresses, the projections help to define the era. And now a few words about the cast. We all know how fabulous Jen Maren is from shows like Glensheen (which returns this summer), and she has a great presence as the old pro Cora, a bit world-weary but still with a passion to perform. The other three women are new to me and are all lovely, especially when singing in harmony. In particular, Christine Polich is a standout as the plucky Julia, with a really terrific voice, great vocal control, and a natural charm and presence. This world premiere new musical Ragtime Women is an exciting debut for the new company Theatre Elision, which is planning five musicals in their 2017-2018 season, including one original. Keep your eye out for them (visit their website and/or follow them on Facebook).